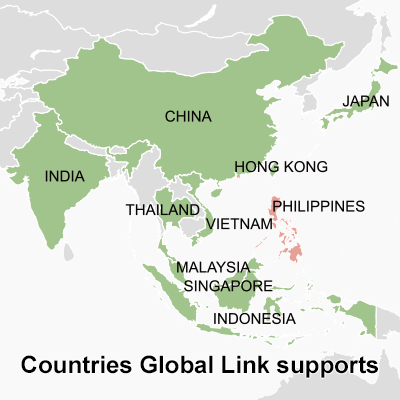 V-Cube added the Philippines and Hong Kong as countries covered for "Global Link" | V-cube, Inc.
as countries covered for "Global Link"
V-cube, Inc. (Headquarters at Meguro, Tokyo, President & CEO：Naoki Mashita) will add the Philippines and Hong Kong on 17th of November, 2014. as countries covered for "Global Link" – a feature(*1) to enhance global usability of V-CUBE Meeting . Mainly focused on Asia, our "Global Link" feature also offers coverage for United States and UK, which guarantees great web conference network environment throughout Europe and the rest of the world. The No. of countries covered by "Global Link" is increased to 12 by our new addition of Philippines and Hong Kong. The network environment between Japan and Asian countries often experience delay and disconnections, which affects the stability of our web conference services. Also, it is extremely costly to establish dedicated Internet lines for overseas video conference end-points and offer the same level of service as in Japan. V-CUBE started to provide "Global Link" service since the end of November, 2011 with the goal of providing stable and comfortable network environment for web conference usage. Countries covered at that time consist of Japan, China, Singapore, Malaysia, Indonesia, Thailand and Vietnam and since then we have been gradually expanding the coverage. By adding the Philippines and Hong Kong to "Global Link" this time, we hope to better support companies from both Japan and other countries. As a result, with improved communication environment between branches, local manufacture etc, companies can use "V-CUBE Meeting" and "Global Link" to further expand business to local markets in Asia and the world. V-CUBE will continue to make efforts toward providing the best visual communication service in Asia. - Adding the Philippines and Hong Kong to connect existing dedicated network between Japan, China, Singapore, Malaysia, Indonesia, Thailand, Vietnam, India, USA and U.K. with enhanced network environment. *1: This function is for “V-cube Meeting” under “V-CUBE ONE” Global plan.